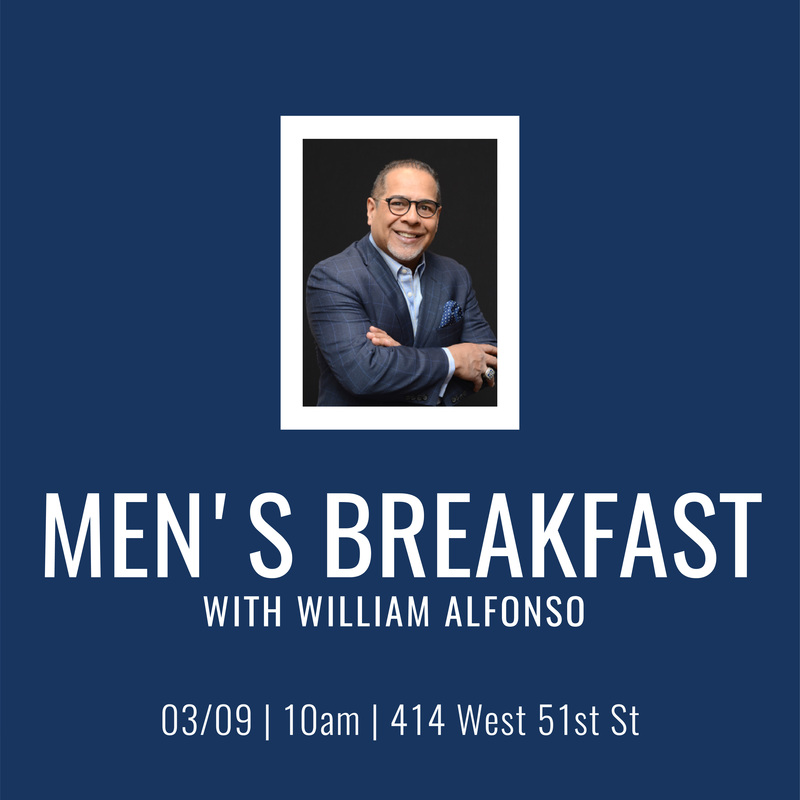 Men – you’re invited to join us for breakfast on Saturday, March 9 at 414 W. 51st St. at 10:00 AM. Willie Alfonso, chaplain for the New York Yankees, will be the guest speaker at this event. William was born and raised in Brooklyn, New York, the product of an abusive and alcoholic father. At the age of eleven he was forced to leave home when his mother chose to turn him away after he defended her during a beating from his then crazed and drunken father. William spent his teenage years living with relatives and friends on the streets of Brooklyn. He turned to drug use early on and continued destructive habits into his young adult years. In 1972, at the age of eighteen, he married his wife Nancy and continued to abuse drugs until Palm Sunday, 1981 when he received Jesus Christ as his Lord and Savior. William served in several ministries at his local church (Sunday School, Children’s Church, Youth Ministries, and Prison Ministry) until 1996 when he and his wife felt called into full-time, inner-city ministry. William then left his Wall Street job as a printer and became an Assistant Pastor for The Christian and Missionary Alliance at New Hope Community Church, Staten Island. While at New Hope Community Church, William began working with teenagers in a sports ministry. Using his love for God, life testimony and his love for sports, he became a great influence in the lives of many of the young people he came in contact with. Many of these young people received Christ or rededicated their lives to live for God. After five years at New Hope Community Church, William and his wife took another step of faith and became part of Campus Crusade for Christ in their outreach to athletes, through the ministry Athletes In Action. He now serves as Chaplain to the Staten Island Yankees and the Hispanic players of the New York Yankees. Through William’s work with Athletes In Action and the friendships he has developed with players, he has seen many of them develop into Christ-centered leaders. Players such as Mariano Rivera and Robinson Cano of the New York Yankees, Coach Byron Scott, Alonzo Mourning, and others have dedicated themselves to come alongside William and his ministry to young people. In addition to his commitment to Athletes in Action, William served as director of Urban Impact a ministry of Pillar of Fire International dedicated to the mentoring of young boys and girls through sports ministry. William continues to reside on Staten Island with his wife Nancy. They have three daughters, Venus, Yvette and Krista. He has founded a non-profit organization on Staten Island called “It’s A New Beginning”. It is a ministry dedicated to spreading the message of Christ.